Lead or be lunch! LEAD or be Lunch!. Lead or be lunch! Our new team motto … This will be the motto driving our team for the months and years ahead All. 1 Lead or be lunch! 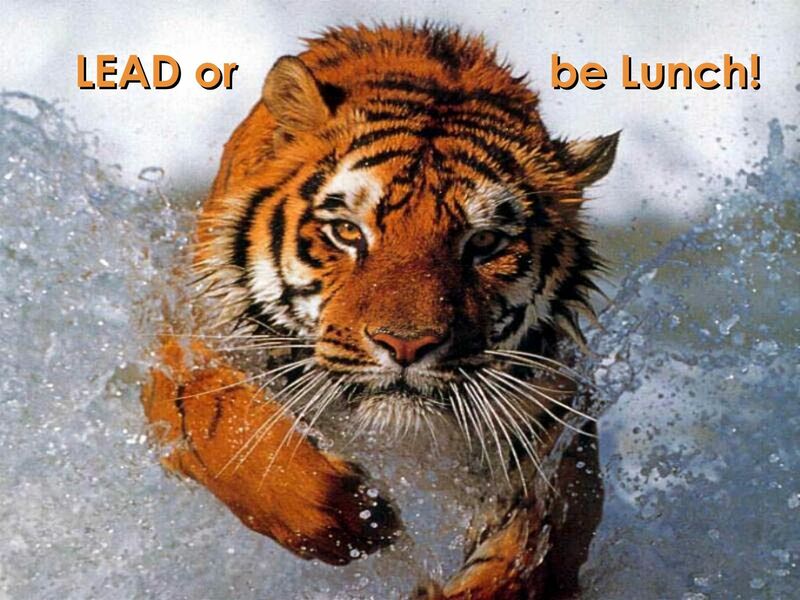 LEAD or be Lunch! 2 Lead or be lunch! 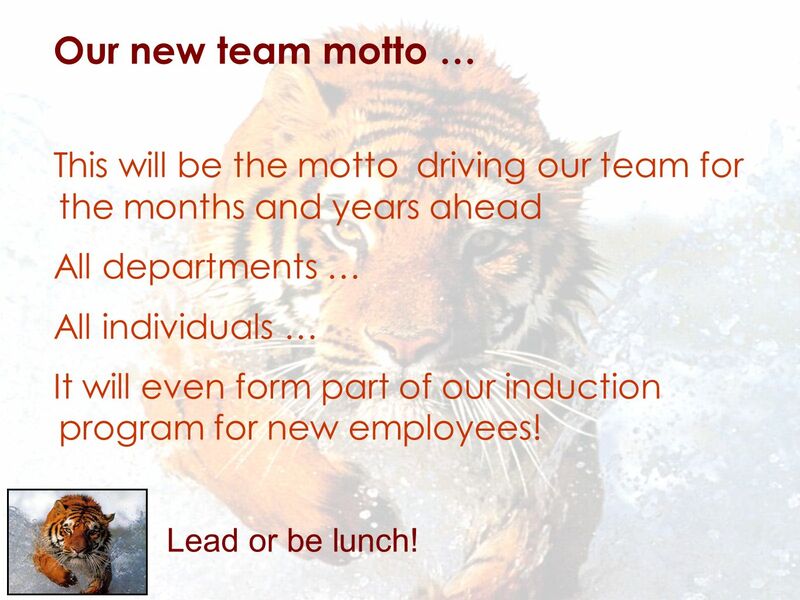 Our new team motto … This will be the motto driving our team for the months and years ahead All departments … All individuals … It will even form part of our induction program for new employees! 5 Lead or be lunch! Every day is a best-in-class day! 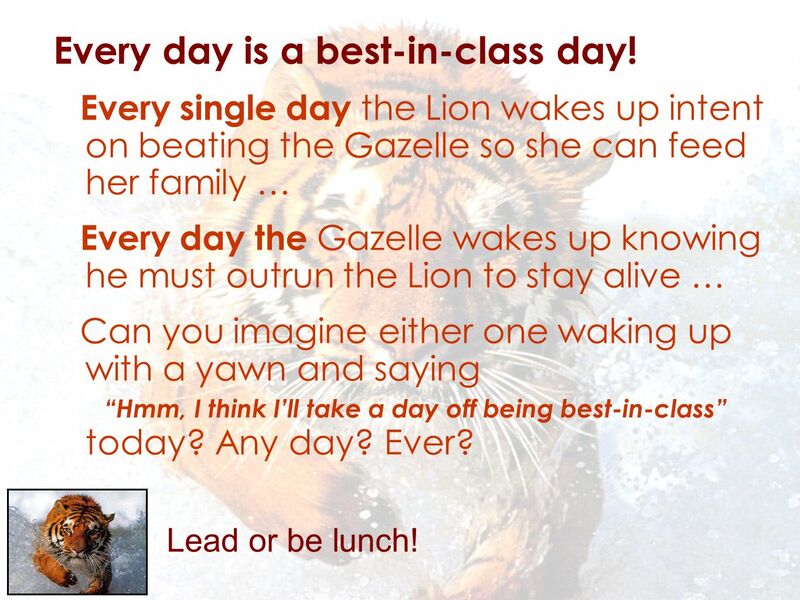 Every single day the Lion wakes up intent on beating the Gazelle so she can feed her family … Every day the Gazelle wakes up knowing he must outrun the Lion to stay alive … Can you imagine either one waking up with a yawn and saying Hmm, I think Ill take a day off being best-in-class today? Any day? Ever? 6 Lead or be lunch! 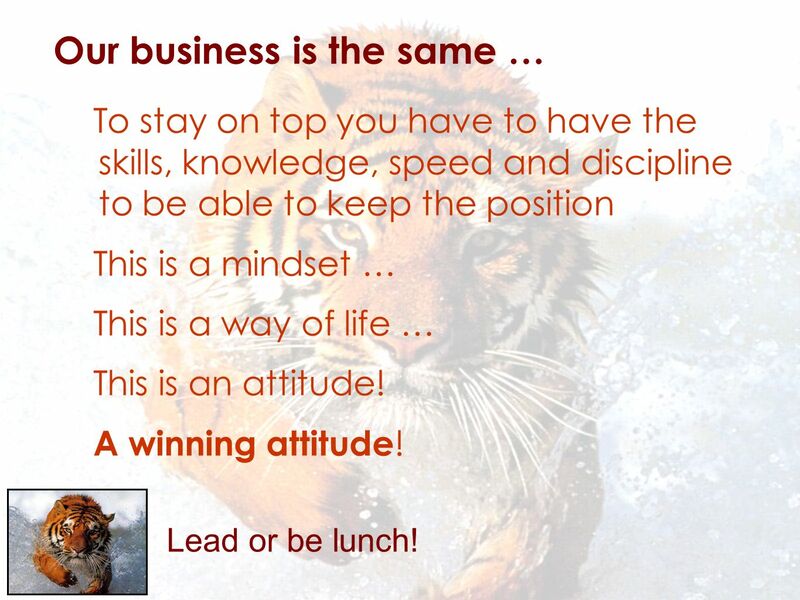 Our business is the same … To stay on top you have to have the skills, knowledge, speed and discipline to be able to keep the position This is a mindset … This is a way of life … This is an attitude! A winning attitude ! 8 Lead or be lunch! 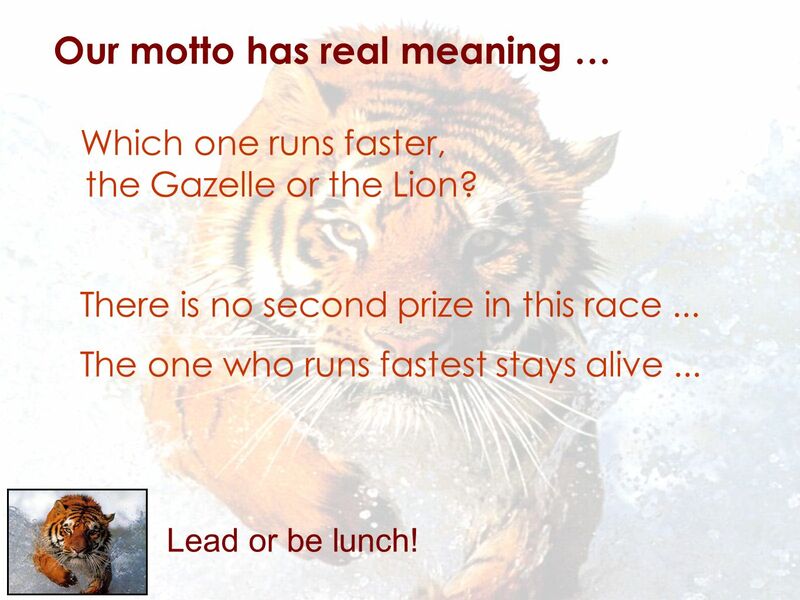 LEAD or be Lunch! 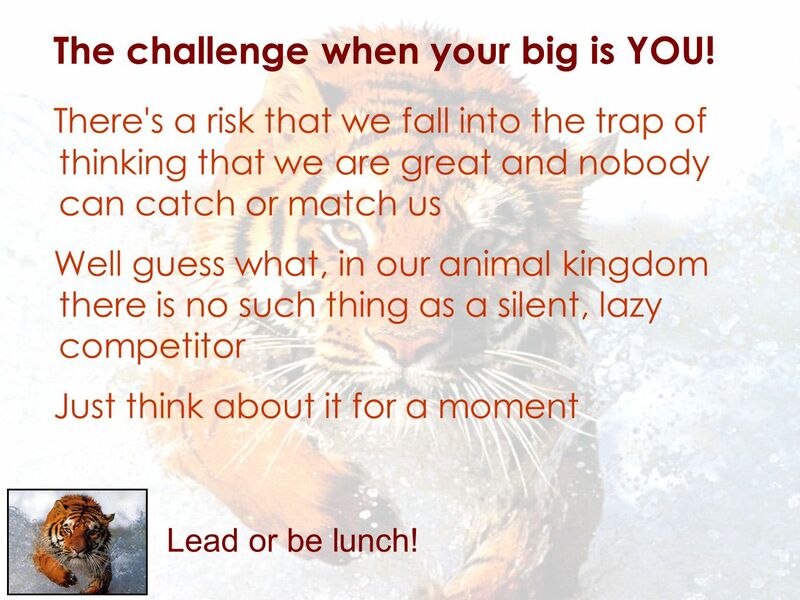 Download ppt "Lead or be lunch! 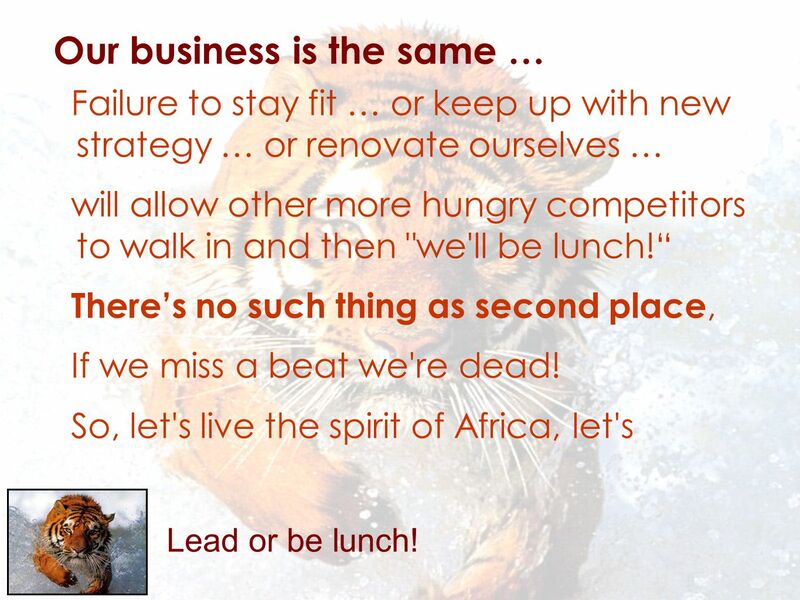 LEAD or be Lunch!. Lead or be lunch! Our new team motto … This will be the motto driving our team for the months and years ahead All." Choose the correct option. If you __________ the letter today, I´ll receive it soon End. Structuring For Change West Virginia Institutes for 21 st Century Leadership Spring Session, 2008. The Performance Sailing School & ClubSan Francisco / Puerto Vallarta. Run, Don’t Walk Using the Web 2.0 in Education. What We’ll Cover Del.icio.us Blogs Technorati Bloglines Wikis. Good old lessons in teamwork from an age-old fable The Tortoise And The Hare. Developing Top Sales Superstars W/ Craig Lockerd CEO – AutoMax Recruiting And Training. To learn to walk, we must risk falling over.To learn to walk, we must risk falling over. To make a dollar, we must risk losing it.To make a dollar, we. PHYSICAL EDUCATION Movement with a purpose -Exercise for today, knowledge for a lifetime of health. Predator Behavior  Numerical Response –  Predators will gather around a high density prey area  Predators “learn” where prey is (by experience or watching. “Soccer Song”. ashamed If you are ashamed, you feel bad about having done something wrong. The Amazing Cheetah Phylum: Chordata Class: Mammalia Order: Carnivore Family: Felidae Genus: Acinonyx Species: Jubatus. Partner share Describe a movie where a toy comes to life. Learning Objective: summarize literary text.